See the current national offers on new Toyota vehicles. They won’t last long so grab them while you can! Get the best return on your trade-in at Kelowna Toyota. Use our online tool to appraise your vehicle. My Kelowna Toyota peeps always take great care of me and my Yaris :) Thanks KT! Joe Sassine and the team at Kelowna Toyota made the whole process of buying our vehicle a breeze. 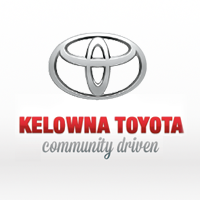 Every year Kelowna Toyota donates thousands to local charities. We are proud to stand behind our "Community Driven" tagline. We create a relaxed environment with emphasis on developing strong, long term relationships and a family atmosphere. We empower our staff to go the extra mile to create an exceptional customer experience – We sell an experience before the product.